For other uses, see Saint (disambiguation). The English word "saint" comes from the Latin "sanctus". The word translated in Greek is "ἅγιος" (hagios), which means "holy". The word ἅγιος appears 229 times in the Greek New Testament, and its English translation 60 times in the corresponding text of the King James Version of the Bible. The word sanctus was originally a technical one in ancient Roman religion, but due to its "globalized" use in Christianity the modern word "saint" in English and its equivalent in Romance languages is now also used as a translation of comparable terms for persons "worthy of veneration for their holiness or sanctity" in other religions. The anthropologist Lawrence Babb in an article about Sathya Sai Baba asks the question "Who is a saint? ", and responds by saying that in the symbolic infrastructure of some religions, there is the image of a certain extraordinary spiritual king's "miraculous powers", to whom frequently a certain moral presence is attributed. These saintly figures, he asserts, are "the focal points of spiritual force-fields". They exert "powerful attractive influence on followers but touch the inner lives of others in transforming ways as well". According to the Catholic Church, a "saint" is anyone in Heaven, whether recognized on Earth or not, who form the "great cloud of witnesses" (Hebrews 12:1). These "may include our own mothers, grandmothers or other loved ones (cf. 2 Tim 1:5)" who may have not always lived perfect lives but "amid their faults and failings they kept moving forward and proved pleasing to the Lord". The title "Saint" denotes a person who has been formally canonized, that is, officially and authoritatively declared a saint, by the Church as holder of the Keys of the Kingdom of Heaven, and is therefore believed to be in Heaven by the grace of God. There are many persons that the Church believes to be in Heaven who have not been formally canonized and who are otherwise titled "saints" because of the fame of their holiness. Sometimes the word "saint" also denotes living Christians. In his book Saint of the Day, editor Leonard Foley, OFM says this: the "[Saints'] surrender to God's love was so generous an approach to the total surrender of Jesus that the Church recognizes them as heroes and heroines worthy to be held up for our inspiration. They remind us that the Church is holy, can never stop being holy and is called to show the holiness of God by living the life of Christ." The Catholic Church teaches that it does not "make" or "create" saints, but rather recognizes them. Proofs of heroicity required in the process of beatification will serve to illustrate in detail the general principles exposed above upon proof of their "holiness" or likeness to God. According to the Catechism of the Catholic Church Chapter 2, Article 1, 61, "The patriarchs, prophets, and certain other Old Testament figures have been and always will be honored as saints in all the church's liturgical traditions." 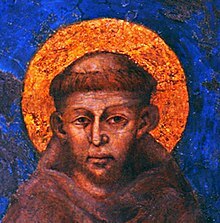 On 3 January 993, Pope John XV became the first pope to proclaim a person a "saint" from outside the diocese of Rome: on the petition of the German ruler, he had canonized Bishop Ulrich of Augsburg. Before that time, the popular "cults", or venerations, of saints had been local and spontaneous and were confirmed by the local bishop. Pope John XVIII subsequently permitted a cult of five Polish martyrs. Pope Benedict VIII later declared the Armenian hermit Symeon to be a saint, but it was not until the pontificate of Pope Innocent III that the Popes reserved to themselves the exclusive authority to canonize saints, so that local bishops needed the confirmation of the Pope. Walter of Pontoise was the last person in Western Europe to be canonized by an authority other than the Pope: Hugh de Boves, the Archbishop of Rouen, canonized him in 1153. Thenceforth a decree of Pope Alexander III in 1170 reserved the prerogative of canonization to the Pope, insofar as the Latin Church was concerned. One source claims that "there are over 10,000 named saints and beatified people from history, the Roman Martyrology and Orthodox sources, but no definitive head count". Alban Butler published Lives of the Saints in 1756, including a total of 1,486 saints. The latest revision of this book, edited by the Jesuit Herbert Thurston and the British author Donald Attwater, contains the lives of 2,565 saints. Monsignor Robert Sarno, an official of the Congregation for the Causes of Saints of the Holy See, expressed that it is impossible to give an exact number of saints. The veneration of saints, in Latin cultus, or the "cult of the Saints", describes a particular popular devotion or entrustment of one's self to a particular saint or group of saints. Although the term "worship" is sometimes used, it is only used with the older English connotation of honoring or respecting (dulia) a person. According to the Church, Divine worship is in the strict sense reserved only to God (latria) and never to the Saints. One is permitted to ask the Saints to intercede or pray to God for persons still on Earth, just as one can ask someone on Earth to pray for him. 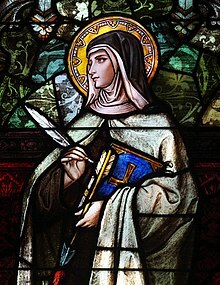 A saint may be designated as a patron saint of a particular cause, profession, or locale, or invoked as a protector against specific illnesses or disasters, sometimes by popular custom and sometimes by official declarations of the Church. Saints are not believed to have power of their own, but only that granted by God. Relics of saints are respected, or "venerated", similar to the veneration of holy images and icons. 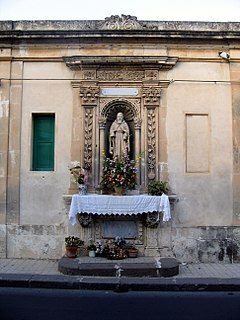 The practice in past centuries of venerating relics of saints with the intention of obtaining healing from God through their intercession is taken from the early Church. For example, an American deacon claimed in 2000 that Bl. John Henry Cardinal Newman interceded with God to cure him of a physical illness. The deacon, Jack Sullivan, asserted that after addressing Newman he was cured of spinal stenosis in a matter of hours. In 2009, a panel of theologians concluded that Sullivan's recovery was the result of his prayer to Newman. According to the Church, to be deemed a miracle, "a medical recovery must be instantaneous, not attributable to treatment, disappear for good." Once a person has been canonized, the deceased body of the saint is considered holy as a relic. The remains of saints are called holy relics and are usually used in churches. Saints' personal belongings may also be used as relics. Some of the saints have a special symbol by tradition, e.g., Saint Lawrence, deacon and martyr, is identified by a gridiron because he is believed to have been burned to death on one. This symbol is found, for instance, in the Canadian heraldry of the office responsible for the St. Lawrence Seaway. Formal canonization is a lengthy process, often of many years or even centuries. The first stage in this process is an investigation of the candidate's life by an expert. After this, the official report on the candidate is submitted to the bishop of the pertinent diocese and more study is undertaken. The information is then sent to the Congregation for the Causes of Saints of the Holy See for evaluation at the universal level of the Church. If the application is approved the candidate may be granted the title "Venerable". Further investigation may lead to the candidate's beatification with the title "Blessed", which is elevation to the class of the Beati. Next, and at a minimum, proof of two important miracles obtained from God through the intercession of the candidate are required for formal canonization as a saint. These miracles must be posthumous. Finally, after all of these procedures are complete, the Pope may canonize the candidate as a saint for veneration by the universal Church. In the Eastern Orthodox Church a saint is defined as anyone who is in Heaven, whether recognized here on earth, or not. By this definition, Adam and Eve, Moses, the various prophets, except for the angels and archangels are all given the title of "Saint". 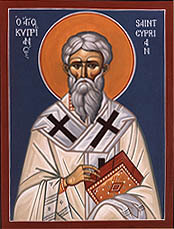 Sainthood in the Orthodox Church does not necessarily reflect a moral model, but the communion with God: there are countless examples of people who lived in great sin and became saints by humility and repentance, such as Mary of Egypt, Moses the Ethiopian, and Dysmas, the repentant thief who was crucified. Therefore, a more complete Eastern Orthodox definition of what a saint is, has to do with the way that saints, through their humility and their love of humankind, saved inside them the entire Church, and loved all people. Orthodox belief considers that God reveals saints through answered prayers and other miracles. Saints are usually recognized by a local community, often by people who directly knew them. As their popularity grows they are often then recognized by the entire church. The word "canonization" means that a Christian has been found worthy to have his name placed in the canon (official list) of saints of the Church. The formal process of recognition involves deliberation by a synod of bishops. the Orthodox Church does not require the manifestation of miracles; what is required is evidence of a virtuous life. If the ecclesiastical review is successful, this is followed by a service of Glorification in which the Saint is given a day on the church calendar to be celebrated by the entire church. This does not, however, make the person a saint; the person already was a saint and the Church ultimately recognized it. As a general rule only clergy will touch relics in order to move them or carry them in procession, however, in veneration the faithful will kiss the relic to show love and respect toward the saint. The altar in an Orthodox church usually contains relics of saints, often of martyrs. Church interiors are covered with the Icons of saints. When an Orthodox Christian venerates an icons of a saint he is venerating the image of God which he sees in the saint. In high-church contexts, such as Anglo-Catholicism, a saint is generally one to whom has been attributed (and who has generally demonstrated) a high level of holiness and sanctity. In this use, a saint is therefore not merely a believer, but one who has been transformed by virtue. In Catholicism, a saint is a special sign of God's activity. The veneration of saints is sometimes misunderstood to be worship, in which case it is derisively termed "hagiolatry". So far as invocation of the saints is concerned, one of the Church of England's Articles of Religion "Of Purgatory" condemns "the Romish Doctrine concerning...(the) Invocation of Saints" as "a fond thing vainly invented, and grounded upon no warranty of Scripture, but rather repugnant to the Word of God". Anglo-Catholics in Anglican provinces using the Articles often make a distinction between a "Romish" and a "Patristic" doctrine concerning the invocation of saints, permitting the latter in accordance with Article XXII. Indeed, the theologian E.J. Bicknell, stated that the Anglican view acknowledges that the term "invocation may mean either of two things: the simple request to a saint for his prayers (intercession), 'ora pro nobis,' or a request for some particular benefit. In medieval times the saints had come to be regarded as themselves the authors of blessings. Such a view was condemned but the former was affirmed." Anglicans believe that the only effective Mediator between the believer and God the Father, in terms of redemption and salvation, is God the Son, Jesus Christ. Historical Anglicanism has drawn a distinction between the intercession of the saints and the invocation of the saints. The former was generally accepted in Anglican doctrine, while the latter was generally rejected." There are some, however, in Anglicanism, who do beseech the saints' intercession. Those who beseech the saints to intercede on their behalf make a distinction between "mediator" and "intercessor", and claim that asking for the prayers of the saints is no different in kind than asking for the prayers of living Christians. Anglican Catholics understand sainthood in a more Catholic or Orthodox way, often praying for intercessions from the saints and celebrating their feast days. The intercession of saints was criticized in the Augsburg Confession, Article XXI: Of the Worship of the Saints. This criticism was refuted by the Catholic side in the Confutatio Augustana, which in turn was refuted by the Lutheran side in the Apology to the Augsburg Confession. While Methodists as a whole do not practice the patronage or veneration of saints, they do honor and admire them. Methodists believe that all Christians are saints, but mainly use the term to refer to biblical people, Christian leaders, and martyrs of the faith. Many Methodist churches are named after saints, such as the Twelve Apostles, John Wesley, etc. Although, most are named after geographical locations associated with an early circuit or prominent location. Some Methodist congregations observe All Saints Day if they follow the liturgical calendar. Many encourage the study of saints, that is, the biography of holy people. The beliefs within The Church of Jesus Christ of Latter-day Saints (Mormons) with regard to saints are similar but not quite the same as the Protestant tradition. In the New Testament, saints are all those who have entered into the Christian covenant of baptism. The qualification "latter-day" refers to the doctrine that members are living in the "latter days", before the Second Coming of Christ, and is used to distinguish the members of the church, which considers itself the restoration of the ancient Christian church. Members are therefore often referred to as "Latter-day Saints" or "LDS", and among themselves as "saints". The use of the term "saint" is not exclusive to Christianity. In many religions, there are people who have been recognized within their tradition as having fulfilled the highest aspirations of religious teaching. In English, the term saint is often used to translate this idea from many world religions. The Jewish hasid or tsaddiq, the Islamic Mu'min, the Zoroastrian fravashi, the Hindu rsi or guru, the Buddhist arahant or bodhisattva, the Daoist shengren, the Shinto kami and others have all been referred to as saints." Cuban Santería, Haitian Vodou, Trinidad Orisha-Shango, Brazilian Umbanda, Candomblé, and other similar syncretist religions adopted the Catholic saints, or at least the images of the saints, and applied their own spirits/deities to them. They are worshiped in churches (where they appear as saints) and in religious festivals, where they appear as the deities. The name santería was originally a pejorative term for those whose worship of saints deviated from Catholic norms. Buddhists in both the Theravada and Mahayana traditions hold the Arhats in special esteem, as well as Bodhisattvas, other Buddhas, or eminent members of the Sangha. Tibetan Buddhists hold the tulkus (reincarnates of deceased eminent practitioners) as living saints on earth. Hindu saints are those recognized by Hindus as showing a great degree of holiness and sanctity. Hinduism has a long tradition of stories and poetry about saints. There is no formal canonization process in Hinduism, but over time, many men and women have reached the status of saints among their followers and among Hindus in general (unlike in Christianity, Hinduism does not canonize people as saints after death, but they can be accepted as saints during their lifetime). Hindu saints have often renounced the world, and are variously called gurus, sadhus, rishis, devarishis, rajarshis, saptarishis, brahmarshis, swamis, pundits, purohits, pujaris, acharyas, pravaras, yogis, yoginis, and other names. Some Hindu saints are given god-like status, being seen as incarnations of Vishnu, Shiva, Devi and other aspects of the Divine—this can happen during their lifetimes, or sometimes many years after their deaths. This explains another common name for Hindu saints: godmen. Islam has had a rich history of veneration of saints (often called wali, which literally means "Friend [of God]"), which has declined in some parts of the Islamic world in the twentieth century due to the influence of the various streams of Salafism. In Sunni Islam, the veneration of saints became a very common form of devotion early on, and saints came to be defined in the eighth-century as a group of "special people chosen by God and endowed with exceptional gifts, such as the ability to work miracles." The classical Sunni scholars came to recognize and honor these individuals as venerable people who were both "loved by God and developed a close relationship of love to Him." "Belief in the miracles of saints (karāmāt al-awliyāʾ) ... [became a] requirement in Sunni Islam [during the classical period]," with even medieval critics of the ubiquitous practice of grave visitation like Ibn Taymiyyah emphatically declaring: "The miracles of saints are absolutely true and correct, and acknowledged by all Muslim scholars. The Quran has pointed to it in different places, and the sayings of the Prophet have mentioned it, and whoever denies the miraculous power of saints are innovators or following innovators." The vast majority of saints venerated in the classical Sunni world were the Sufis, who were all Sunni mystics who belonged to one of the four orthodox legal schools of Sunni law. The term Tzadik ("righteous"), and its associated meanings, developed in rabbinic thought from its Talmudic contrast with Hasid ("pious"), to its exploration in ethical literature, and its esoteric spiritualisation in Kabbalah. In Hasidic Judaism, the institution of the Tzadik assumed central importance, combining former elite mysticism with social movement for the first time. The concept of sant or bhagat is found in North Indian religious thought including Sikhism, most notably in the Sri Guru Granth Sahib. Figures such as Kabir, Ravidas, Namdev, and others are known as "Sants" or "Bhagats". The term Sant is applied in the Sikh and related communities to beings that have attained enlightenment through God realization and spiritual union with God via repeatedly reciting the name of God (Naam Japo). Countless names of God exist, in Sikhism, Naam (spiritual internalization of God's name) is commonly attained through the name of Waheguru, which translates to "Wondrous Guru". Sikhs are encouraged to follow the congregation of a Sant (Sadh Sangat) or "The Company of the Holy". Sants grace the Sadh Sangat with knowledge of the Divine God, and how to take greater steps towards obtaining spiritual enlightenment through Naam. Sants are to be distinguished from "Guru" (such as Guru Nanak) who have compiled the path to God enlightenment in the Sri Guru Granth Sahib. Gurus are the physical incarnation of God upon Earth. Sikhism states however, that any beings that have become one with God are considered synonymous with God. As such, the fully realized Sant, Guru, and God are considered one. ^ Woodward, Kenneth L. (1996). Making Saints. Simon & Schuster. p. 16. ISBN 978-0-684-81530-5. Among other Christian churches, the Russian Orthodox retains a vigorous devotion to the saints, especially the early church fathers and martyrs. On rare occasions, new names (usually monks or bishops) are grafted onto their traditional list of saints.... Something like the cult continues among Anglicans and Lutherans, who maintain feast days and calendars of saints. But while the Anglicans have no mechanism for recognizing new saints, the Lutherans from time to time do informally recommend new names (Da Hammarskjold, Dietrick Bonhoeffer, and Pope John XXIII are recent additions) for thanksgiving and remembrance by the faithful. The saint, then, is a familiar figure in all world religions. But only the Roman Catholic Church has a formal, continuous, and highly rationalized process for 'making' saints. ^ a b c Bebis, George (n.d.). "The Lives of the Saints". Greek Orthodox Archdiocese of America. Retrieved 7 May 2016. ^ a b Jones, Lindsay, ed. (2005). "Sainthood". Thomson Gale Encyclopedia of Religion (2nd ed.). Macmillan. p. 8033. Historians of religion have liberated the category of sainthood from its narrower Christian associations and have employed the term in a more general way to refer to the state of special holiness that many religions attribute to certain people. The Jewish hasid or tsaddiq, the Muslim waliy, the Zoroastrian fravashi, the Hindu rsi or guru, the Buddhist arahant or bodhisattva, the Daoist shengren, the Shinto kami and others have all been referred to as saints. ^ Babb, Lawrence A. "Sathya Sai Baba's Saintly Play", in Hawley, John Stratton, ed. Saints and Virtues. Berkeley: University of California Press, 1987. pp. 168–170. ISBN 0-520-06163-2. ^ a b "Gaudete et exsultate: Apostolic Exhortation on the call to holiness in today's world". Holy See. 19 March 2018. Retrieved 4 May 2018. ^ Kevin Cotter. "How Does Someone Become a Saint? A 5-Step Process". focusoncampus, CHURCH. Retrieved 23 September 2017. ^ "Catechism of the Catholic Church (Second Edition)". Scborromeo.org. Retrieved 12 October 2013. ^ a b c Luscombe, David and Riley-Smith, Jonathan. 2004. New Cambridge Medieval History: c.1024–c.1198, Volume 5. p. 12. ^ "Alexander III". Saint-mike.org. Retrieved 12 October 2013. ^ "Religion: 2,565 Saints". Time. 6 August 1956. Retrieved 23 May 2010. ^ "Keeping Saints Alive". CBS News. 4 April 2010. ^ Jenna Russell, "Marshfield man's prayer an answer in sainthood query", The Boston Globe, 28 April 2009, B1, 4. ^ a b c d e "The Steps of Canonization". HowStuffWorks. ^ "Article XXII". Eskimo.com. Retrieved 12 October 2013. ^ a b Sokol, David F. (2001). The Anglican Prayer Life: Ceum Na Corach', the True Way. p. 14. ISBN 978-0-595-19171-0. In 1556 Article XXII in part read... "The Romish doctrine concerning...invocation of saints, is a fond thing vainly invented, and grounded upon no warranty of Scripture, but rather repugnant to the word of God." The term "doctrina Romanensium" or Romish doctrine was substituted for the "doctrina scholasticorum" of the doctrine of the school authors in 1563 to bring the condemnation up to date subsequent to the Council of Trent. As E.J. Bicknell writes, invocation may mean either of two things: the simple request to a saint for his prayers (intercession), 'ora pro nobis,' or a request for some particular benefit. In medieval times the saints had come to be regarded as themselves the authors of blessings. Such a view was condemned but the former was affirmed. ^ Augsburg Confession, Article 21, "Of the Worship of the Saints". trans. Kolb, R., Wengert, T., and Arand, C. Minneapolis: Fortress Press, 2000. ^ "1530 Roman Confutation". bookofconcord.org. ^ "The Sin of Idolatry and the Catholic Concept of Iconic Participation". Philvaz.com. Retrieved 25 December 2012. ^ Smith, Joseph Jr. "Pearl of Great Price". ^ Lindsay Jones, ed. (2005). Thomson Gale Encyclopedia of Religion (in Tajik). Sainthood (Second ed.). Macmillan Reference USA. p. 8033. ^ Bhaskarananda, Swami (2002). The Essentials of Hinduism. Seattle: The Vedanta Society of Western Washington. p. 12. ISBN 978-1-884852-04-6. ^ Robin Rinehart (1 January 2004). Contemporary Hinduism: Ritual, Culture, and Practice. ABC-CLIO. pp. 87–90. ISBN 978-1-57607-905-8. Retrieved 3 June 2013. ^ Kenneth L. Woodward (10 July 2001). The Book of Miracles: The Meaning of the Miracle Stories in Christianity, Judaism, Buddhism, Hinduism and Islam. Simon & Schuster. p. 267. ISBN 978-0-7432-0029-5. Retrieved 3 June 2013. ^ a b Radtke, B., "Saint", in: Encyclopaedia of the Qurʾān, General Editor: Jane Dammen McAuliffe, Georgetown University, Washington DC. ^ Khalsa, Sant Singh (2007). Sri Guru Granth Sahib: English Translation of Sri Guru Granth Sahib. Arizona: Hand Made Books (Mandeep Singh). pp. 12–263. Beyer, Jürgen, et al., eds. Confessional sanctity (c. 1550 – c. 1800). Mainz: Philipp von Zabern, 2003. Hawley, John Stratton, ed. Saints and Virtues. Berkeley: University of California Press, 1987. ISBN 0-520-06163-2. Hein, David. "Saints: Holy, Not Tame". Sewanee Theological Review 49 (2006): 204–217. O'Malley, Vincent J. Ordinary Suffering of Extraordinary Saints, 1999. ISBN 0-87973-893-6. Trigilio, John; Brighenti, Kenneth (2010). Saints for Dummies. p. 363. ISBN 978-0-470-53358-1. Hebert, Alber (15 October 2004). Saints Who Raised the Dead: True Stories of 400 Resurrection Miracles. Illinois: TAN Books. ISBN 978-0-89555-798-8. Wikimedia Commons has media related to Saints. Look up saint in Wiktionary, the free dictionary. Canonization is the act by which a Christian church declares that a person who has died was a saint, upon which declaration the person is included in the "canon", or list, of recognized saints. Originally, a person was recognized as a saint without any formal process. Later, different processes were developed, such as those used today in the Roman Catholic Church, the Eastern Orthodox Church, Oriental Orthodox Church and the Anglican Communion. Worship is an act of religious devotion usually directed towards a deity. An act of worship may be performed individually, in an informal or formal group, or by a designated leader. Such acts may involve honoring. Veneration, or veneration of saints, is the act of honoring a saint, a person who has been identified as having a high degree of sanctity or holiness. Angels are shown similar veneration in many religions. Philologically, "to venerate" derives from the Latin verb, venerare, meaning to regard with reverence and respect. Veneration of saints is practiced, formally or informally, by adherents of some branches of all major religions, including Christianity, Judaism, Hinduism, Islam, and Buddhism. Michael is an archangel in Judaism, Christianity, and Islam. In Roman Catholic, Eastern Orthodox, Anglican, and Lutheran traditions, he is called "Saint Michael the Archangel" and "Saint Michael". In the Oriental Orthodox and Eastern Orthodox religions, he is called "Saint Michael the Taxiarch". The communion of saints, when referred to persons, is the spiritual union of the members of the Christian Church, living and the dead. They are all part of a single "mystical body", with Christ as the head, in which each member contributes to the good of all and shares in the welfare of all. Intercession of the saints is a doctrine held by the Eastern Orthodox, Oriental Orthodox and Roman Catholic Churches. The practice of praying through saints can be found in Christian writings from the 3rd century onwards. The 4th-century Apostles' Creed states belief in the communion of saints, which certain Christian churches interpret as supporting the intercession of saints. As in Christianity, this practice is controversial in Judaism and Islam. Marian devotions are external pious practices directed to the person of Mary, mother of Jesus, by members of certain Christian traditions. They are performed in Roman Catholicism and Orthodox Christianity, but generally rejected in Protestant denominations. Anglican devotions are private prayers and practices used by Anglican Christians to promote spiritual growth and communion with God. Among members of the Anglican Communion, private devotional habits vary widely, depending on personal preference and on their affiliation with low-church or high-church parishes. Folk saints are dead people or other spiritually powerful entities venerated as saints but not officially canonized. Since they are saints of the "folk", or the populus, they are also called popular saints. Like officially recognized saints, folk saints are considered intercessors with God, but many are also understood to act directly in the lives of their devotees. Christianity in the 21st century is characterized by the pursuit of Church unity and the continued resistance to persecution, and secularization. A sacrament is a Christian rite recognized as of particular importance and significance. There are various views on the existence and meaning of such rites. Many Christians consider the sacraments to be a visible symbol of the reality of God, as well as a means by which God enacts his grace. Many denominations, including the Catholic, Anglican, Lutheran, Methodist, and Reformed, hold to the definition of sacrament formulated by Augustine of Hippo: an outward sign of an inward grace that has been instituted by Jesus Christ. Sacraments signify God's grace in a way that is outwardly observable to the participant.